I recently played the third Spyro GBA game, and it was good (with the exception of certain things), played it 100 percent complete...and that's not what you're here for. I decided to have a bit of fun and dig around some old pre-release screenshots and trailers and compare them to the final version. I created the topic because there were no topics like this in this section. If you played this GBA game, or curious about this topic (if so, possible spoilers then!) - read on! It's somewhat long! Large fruit seemed to have a certain role/running theme in the game. They were placed in different locations...wondering that's the purpose for these...maybe other than background objects (maybe not...). Both of these disappeared in the final version. (NEW) In the first image, you will see that originally the flowers act as decor on the ice level. What? unfrozen flowers laying on the snow on such a long time? In the final version, they are used as box indicators of where you push the ice block containing an enemy in order to proceed through the level. Thanks to GamingMaster_76 for spotting this! With the exception of the large Professor statue and Spyro, everything in the screenshot was different. Perhaps it's an earlier version of the Virtual Playground. What's that item at the top-left corner? It doesn't look like a green swirl to me. It looks like some kind of stone with a gem on the center. For the images you are seeing, I never recalled those images being part of the game. Pretty much never. (NEW) It looks like a beta version of the Fairy Library level. Just look at the rows of office cabinets! Those things only occur when you first enter the first section of the level, and the bonus section. Oh look, more fruit (first image: top, second image: bottom-left)! Spotted by GamingMaster_76...! Another piece of fruit...? Some green stuff laying on the floor (at the top-left corner)? There used to be a purple clean pathway until it was removed - maybe to make the entrance of the Rhynocs n' Clocks a bit more dramatic by adding bones on the ground. 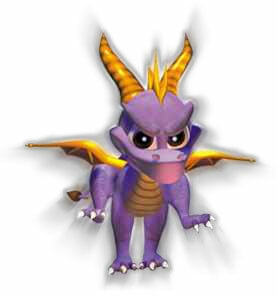 The first image shows that Spyro collected gems during the virtual playground. Interesting... For the other two images, Sparx said a line that never made it into the final version, and the holographic Professor having it's final line changed. It's an earlier version of the Virtual Playground but with the graphics in the final version. See "0.26 - 0.30" in the Trailer section. The infestation room in Rabbit Habitat was originally going to have a large tall carrot as an obstacle. In addition, there was a time limit (implying that you can keep playing even if you fail to burn a rhynoc), and a lower number of ryhnocs to fry. 0.12: The fence at the bottom right corner was missing. 0.13 - 0.15: The "Stormy Passage" section in Dragon Shores doesn't seem to gloomy (bright green instead of pale blue). The cloud didn't disappear after Butler got electrocuted. 0.19 - 0.22: The cage design was different, and there is no evil smile on the turret. 0.26 - 0.30: What? Did Agent 9 shoot it's grappling hook onto a wall and pulled with it far away? That's impossible... Also, the background (behind the twirling colored pencils) was pink instead of dark purple. 0.33 - 0.34: In the top sub-video - there were some tall pencils standing. I guess they replaced them with cones because it was a hassle. 0.35 - 0.42: The arrows (L and R ones), weren't animated. 0.38: There were supposed to be 13 ability items, but one of them was removed in the final version (making it 12 ability items). 0.42 - 0.48: The line of colored bulbs on the floor weren't animated, and the large magic hat can bypass the colored bulbs. Image 3: A sheep wearing a wizard outfit! An enemy and fodder at the same time? What kind of world would this idea best fit in? Rabbit Habitat? Image 6-9: LOOK! More large pieces of fruit! But besides that, all of these are concept art of what the levels are supposed to look like. Not all the items made it into the final version, but it was fun looking at them. ...And that's all for there is to it. Seeing that this game had to be developed under a year (due to time constraints) just like the first two Spyro GBA games, a lot had to be changed...from simple tweaks into gameplay parts that were cut out. Wow! It looks like they made alot of adjustments before releasing this game. I wish they had kept Agent Nine's ability to shoot acrosslong sections with his grappling hook and I wonder what that thirteenth special ability would have been. A lot of tiny, and a few but major changes made when the final version reaches. Indeed so. Maybe the 13th special ability is actually the Warp Device. Thanks for replying to this topic. Great job here, I've never played this game, but I always find stuff like this interesting. Thanks for posting. What is the Virtual Playground anyway? @dingodile555: The Virtual Playground acts as a tutorial level when Spyro enters a round capsule at the start of the game. Oh, you're welcome. Say, do you mind if I use the images/video in my site? @GamingMaster_76: Sure, the images aren't really mine - I just found them and used them as part of my comparison between the pre-release and the final version of the game I posted. Can you link to where you are using the images/video? I also noticed that there were flowers in one of the Yeti Serengeti pictures that weren't there you missed. Ah the flowers. I indeed missed that one. They were reused as indicators of where you push the frozen block containing an enemy in that level. Adding new entry. Looks like a beta version of the library. Note the lettered sector to the right. More fruit and vines. The first image has some in the purple water to the left and the second has them hanging above F.
I'm pretty sure the batteries there were in those hidden areas you get to by holding those three buttons down and entering areas, but I'm not entirely sure because I haven't played this in a while. And I don't really recall those files in the 'Library', but like I said, it's been I while since I last played. First two images: I was actually aware of that, but I didn't actually mention it because during the time I was creating the list - I got very tired. Updating main post. For the third image: I'm pretty sure those batteries in the earlier version are beta regardless. I've gotta get this game... GameStop Here I Come. The game programmrs must LOVE fruit, huh?